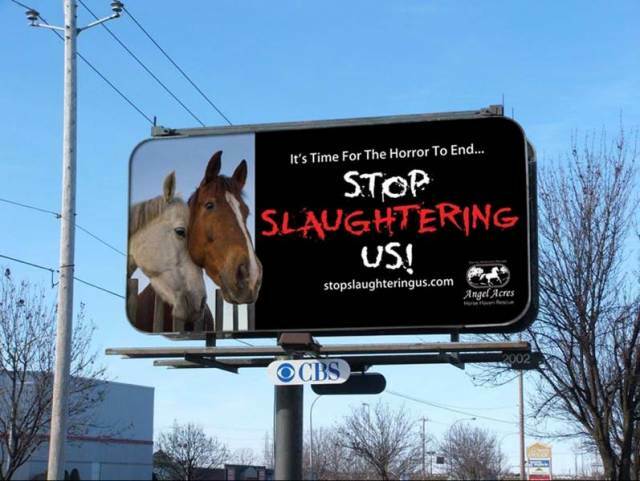 The last equine slaugherhouse in the United States finally shut down, but American horses continue to go to slaughter across our southern and northern borders in record numbers. “There has never been & never will be any way possible to ensure that horses going to slaughter, for the purpose of human consumption, are free of drugs such as Bute, yet no one in the Government seems to care. Why? Because horse slaughter is a great way to pad their wallets? That must be it, because there is not one benefit to horse slaughter, that isn’t monetary & that is only for those who benefit directly from the slaughter industry, which is only the people who are involved with horse slaughter (buyers, transporters, people in the plant, horse racing, PMU farms, Nurse mares, etc.) & the Government. “We need to force the Government to do the right thing, we must let them know that we will not allow our horses to be tortured, abused, maimed & killed in the most barbaric way, we will not tolerate them purposely poisoning people, just to make a buck. The time has come for them to get their heads out of their asses & smarten the hell up. Perhaps you all wonder too, where the mustangs sold to Tom Davis, under BLM sales agreement, have gone ? Where in this economy are all those wonderful homes he found ? While we pay BLM to do a job, the latest scandal and questions reflect the lack of their commitment, as hundreds of wild horses, unfairly targeted and ripped from their rightful habitat in the wild, might be dead, their flesh sold as commercial meat products, instead of being in loving homes, as the fairy tales want you to believe. Perhaps Tom Davis’ alleged history and dealings have been disclosed and BLM Tom Gorey’s stance on an investigation is to be kept in the public eye (email from Gorey below). Davis’ claims to adopt out hundreds of horses to good homes since 3 years is surely an impressive achievement, isn’t it ? Or is it once again a ploy to save face, which hopefully will be seen in the near future, unless Tom Davis will slip thru the system, such as so MANY horses have who so mysteriously vanished over decades. Perhaps those having allegedly been involved in such atrocious under the table dealings will steer clear. They will find another way. They will have to be tracked/monitored until we know the truth. I hope the Denver Post will finish the quest and not let this story end now, until the public knows the launching and outcome of an investigation by those responsible for this mess, the BLM and hopefully and independent source. Please do not stop now. The momentum must be kept. We want the truth. The only save place for our last wild mustangs and burros in this country is in the wild, where they rightfully and by law, belong. See Craig Downer’s Proposal for Reserve Design below. Please share this email. Thank you. Also read the compelling book by Craig C. Downer, wildlife ecologist: “The Wild Horse Conspiracy”. Here is a link to Craig’s proposal. It is posted on the Wild Horse and Burro page on below website above the previous version he released in 2010.
i ASK YOU WOULD THIS BE OK IF IT WERE TO HAPPEN TO A SELECTED GROUP OF PEOPLE??? The wild horses and burros are being cheated out of their fair share of the forage and water resources. The WFRHBA of 1971 plainly states that their legal land (meaning year round territory as of 1971) shall be “devoted principally” to their welfare, meaning in the wild. But all the opposite is happening! This is such a shame! It can and will be changed if we learn how to stand up and become independent from the big exploiters of the public lands. Warning: this takes guts! Thank you for your comment Craig, I so appreciate your personal emails keeping me up-todate. Having lost my password and finally being able to reset, you can be assured I will be doing some heavy duty Blogging this weekend again on this issue. You work is an inspiration to me as is Monikas. We all need be grateful for your dedication, your will to reveal the truth and to FIGHT for the lives of these magnificent animals. Thank you. There are additional posts related to what the BLM is doing, I have contacts in Colorado and close contact with Craig Sowner the author of Wild Horse Conspiracy, a book I highly recommend that you read. Thank you. There are additional posts related to what the BLM is doing, I have contacts in Colorado and close contact with Craig Downer the author of Wild Horse Conspiracy, a book I highly recommend that you read.